The word “dragon” appears 21 times in the Old Testament (King James Version). The Psalmist jubilantly declared, “Praise the LORD from the earth, you dragons, and all deeps:” (Psalm 148:7). Remember that the Bible was originally translated into English long before the word “dinosaur” was coined (back when scientists called the great reptiles “dragons”). Here’s another Psalm: “You shall tread upon the lion and adder: the young lion and the dragon shall you trample under feet” (Psalm 91:13). From the context it is clearly speaking about a real creature that it would be impressive and intimidating to step on! Jeremiah 51:34 states, “he has swallowed me up like a dragon…” which brings to mind the way many carnivorous reptiles gulp their prey whole. Both dragons of the sea (Psalm 74:13) and field (Isaiah 43:20) are mentioned and even the The Vocalization of the Dragon is alluded to. Because of the wailing or howling sound attributed to the tannin and because the habitat of certain tanninim (plural of tannin) is said to be the wilderness (Isaiah 34:13-15, 35:7) some scholars have suggested that the tannin is merely a jackal. Modern Bible translators, who were dubious about having dragons (which they believed to be mythical) in the Bible, prefer the jackal interpretation. The Hebrew word for jackal is “tan” and the plural is “tanim.” So there is a similarity. But this misguided effort falls apart when it comes to translating “tannin of the sea” (Psalm 74:12-13)! Indeed, the word tannin in Genesis 1:21 can be translated: “And God created great sea monsters…” One such sea monster became sufficiently well-known to the ancients to be given the special name “Rahab” (Isaiah 51:9). Likely whales were also considered sea monsters by these Hebrews because Lamentations 4:3 describes tannin who breast feed their young. 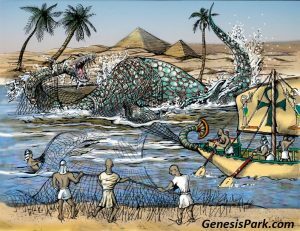 The prophet Ezekiel likened Pharaoh to a sea monster that invaded the Nile river and stirred up the mud as it swam (32:2). The Egyptians used nets to fish the Nile (and still do today). Ezekiel 32:3 talks about netting a dragon and subsequently hauling it up onto the land. Ezekiel 29:3 refers to inserting hooks into the dragon’s jaws to draw it into the open field where the carnivorous animals would feed on its carcass. The picture is a vivid one that might recall an actual historical event that happened in ancient Egypt. The Hebrew word “tannin” is from the root meaning “to extend.” The language conjures up an image of a long-necked plesiosaur-like creature paddling up the river and stirring up the sediments of the Nile delta with its flippers. Just such a creature is depicted in ancient Egyptian art. 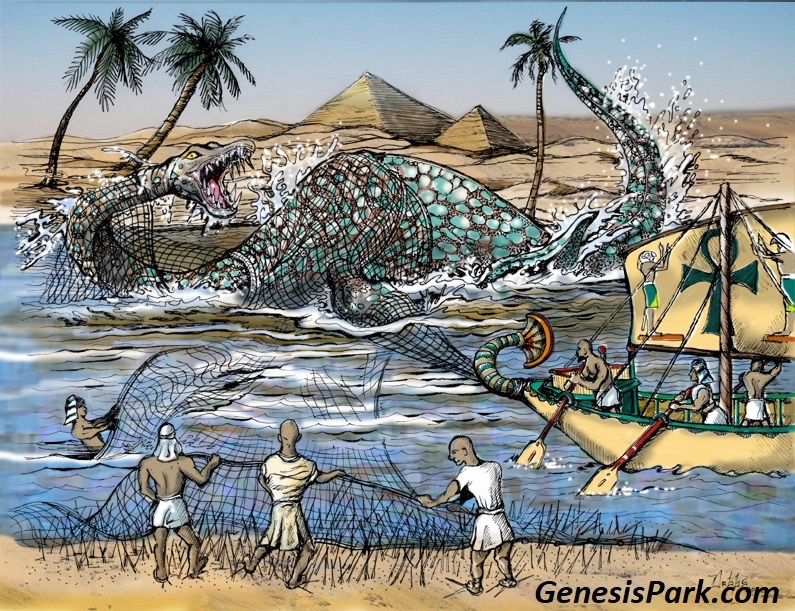 So perhaps Nile fisherman actually captured and killed a sea dragon like Ezekiel describes (photo upper right). The Old Testament seers prophesied against a number of ancient cities. On multiple occasions, the destroyed and abandoned cities were said to become the habitation of dragons (see Isaiah 34:13 and Jeremiah 51:37). The prophet Jeremiah actually made the prediction that Israel would be carried away into captivity and Jerusalem would be broken down and inhabited by dragons (9:11). It seems this came true sometime before Nehemiah came from Babylon to visit the ruined city and rebuild the Jerusalem walls. By then there was a peculiar name give to a well in Nehemiah 2:13 (KJV), the “dragon well”. 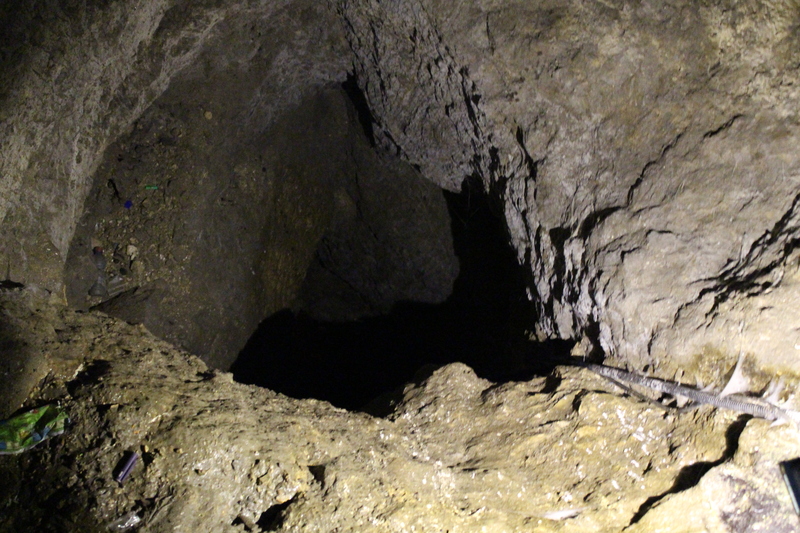 Perhaps the debris near that well was the den of a reptile who had moved in. After killing or chasing off the dragon, the people could again use it and that well was thereafter remembered as the “dragon well.” Tradition informs us that this well is Warren’s Shaft, pictured to the right.